The big day has come. 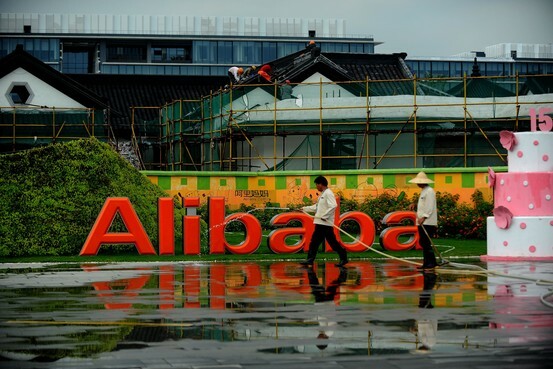 Chinese e-commerce giant Alibaba Group Holding will list on the New York Stock Exchange Friday under the symbol BABA. Executive Chairman Jack Ma is expected to ring the exchange’s opening bell when trading begins at 9:30 a.m. New York time. For Asian investors that will be Friday at 9:30 p.m., Hong Kong/Hangzhou time. Alibaba is seeking to raise as much as $25 billion, and if shares price at the top end of their expected range of $66-$68, it’ll easily become the world’s biggest initial public offering ever. The reigning champion is Agricultural Bank of China, which raised $22.1 billion when it listed in Hong Kong and Shanghai in 2010. Alibaba executives have been on a two-week whirlwind marketing campaign to meet investors, which ends Thursday. (New York, Boston, Baltimore, Denver, Los Angeles, San Francisco, Hong Kong, Singapore, London, Kansas City, Chicago.) Demand for the shares has been strong that bankers stopped taking orders in some places earlier this week, say people familiar with the deal. The final stock price could come out any time between the end of the road show and just before shares start trading. Ahead of the big day, here’s all you need to know about the massive tech IPO. Alibaba is China’s – and by some measures, the world’s biggest online e-commerce company. Its three main sites – Taobao, Tmall and Alibaba.com – have hundreds of millions of users and host millions of merchants and businesses. Alibaba handles more business than any other e-commerce company. It makes money through online marketing, transaction fees it receives from merchants and membership fees. After it lists, how big will Alibaba be compared to other tech giants? After it goes public, Alibaba is expected to be one of the most valuable companies in the world. At the midpoint of the price range unveiled this week, Alibaba would be worth $165 billion, making it the third-largest Internet company by market value, behind Google and Facebook. Here’s how Alibaba’s market value fares against other tech companies. How much could Alibaba ultimately raise? Alibaba is offering 320 million shares in its IPO (123 million new shares issued by the company plus 197 million existing shares owned by current shareholders). If Alibaba sells everything, including some extra shares set aside for underwriters, and the price is set at the top of the range at $68 a share, Alibaba would raise $25 billion. If the price is set at the low end of the range at $66, the deal will raise $24.3 billion. If bankers don’t sell the extra shares, Alibaba will likely raise between $21.1 billion and $21.8 billion. Who are the top shareholders of Alibaba and are they selling their shares? Japan’s Softbank owns 34% of Alibaba. The company has said it doesn’t plan to sell any shares, but after the IPO, its stake will be diluted to 32.4%. Yahoo, which owns 22.4%, said it plans to sell 121.7 million shares, equivalent to a 4.9% stake. Alibaba founder Jack Ma, who owns 8.8%, will be offering 12.7 million shares, or 0.5% in the offering. Joseph Tsai, executive vice chairman, will be selling 4.3 million shares, equivalent to a 0.2% stake. Who are the bankers on the deal? Credit Suisse, Deutsche Bank AG, Goldman Sachs, J.P. Morgan Chase & Co., Morgan Stanley and Citigroup. For a detailed look at the bankers on the deal, go here.